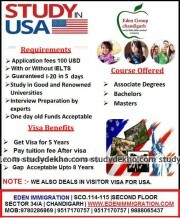 Study Master Shape Your Dreams is located at Sector 17-C, Chandigarh. The institute puts in a lot of efforts and analysis to perform their best in providing the maximum output. The expertise and analysis conducted at the Study Master Shape Your Dreams gives it an edge over all its rivals. The institute aims at building a long term relationship with their clients by providing them good results and working with integrity, honesty and dedication. The decision to study abroad is a very difficult decision as it involves a lot of complexities. Various exams are conducted for non-native English speaking countries to evaluate their hold over the foreign languages. These exams evaluate English skills-reading, listening, writing and speaking. While applying to universities aboard these exam scores are considered as very essential as they are the first step for admission in universities abroad. These entrance exams are very difficult to crack and are not equivalent to just any English exam. In order to crack these exams, one needs proper training, understanding and guidance. The Study Master Shape Your Dreams has professionals who guide their students to attain a good score and obtain positive outcomes. The institute provides training in various fields. The Study Master Shape Your Dreams has professional faculty enriched with knowledge and determination. The faculty is always ready to help their students.